Do you look around your life and see things that should make you feel happy and content yet find yourself feeling sad and discontent? Is your mind always in overdrive? Do you feel anxious and out of control? Are you constantly trying to fix things but getting nowhere? Does everyone around you look like they have it together? Do you wonder how they do it? If this story resonates 'The CBT Journal' has been created for you. Investing just 20 minutes a day in the journal will significantly impact your life, making you feel more content, fulfilled and happy, both in yourself and for everyone around you. The CBT Journal combines two of the most effective psychological tools we have, so you can take control, improve your mindset and start your recovery journey today. 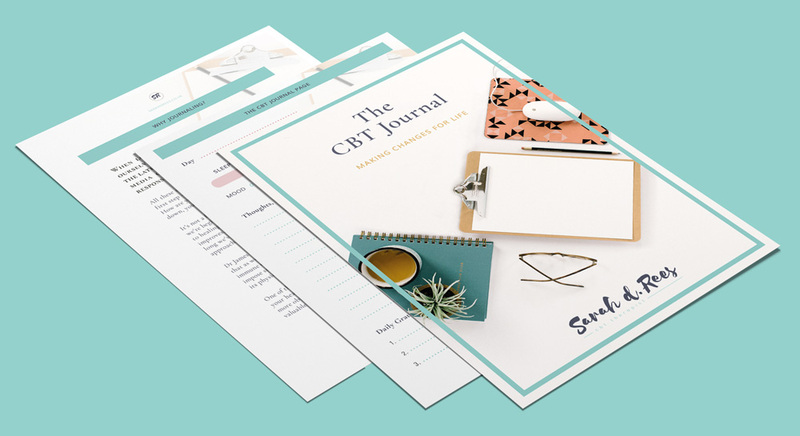 The CBT Journal is a digital download product designed as a four-week project to help you understand your mind so you feel more in control and able to improve your mental health. Alternatively, it can form part of an ongoing daily wellbeing routine. Step 1 - Will guide to around the basic concepts of Cognitive Behavioural Therapy you will understand the psychology and roadmap of your mind. Step 2 - you will develop awareness of how your mind works through using the journalling pages which have a specific CBT framework to help you become more aware of the patterns of your mind. Step 3 - You will learn how to alter the unhelpful patterns of your mind and with the guide and practical worksheets. Alongside standard CBT models illustrating the connections between your thoughts, feelings and behaviours, you’ll find tools and strategies to help you transform the way you think. You’ll learn how to reflect on your behaviour and develop new ways of responding to feelings and emotions. The Journal is divided into two sections. First, you’ll gain a deeper understanding of the principles of CBT and learn how to apply them to your journaling practice. Structured journaling sheets bring your awareness to the thoughts, feelings and behaviours that shape your daily life, revealing patterns and connections you’re currently unaware of. Space for daily gratitude provides balance and helps build emotional resilience. Additional worksheets are provided to help you alter unhelpful thinking patterns, process emotions and change behaviours. To keep you motivated on your journey you'll receive 4 weekly emails with advice, tips and strategies for getting the best out of your journal. You'll also receive an email to join a Private Facebook Group. As you work through The CBT Journal - Ask questions, raise your queries and share ideas in a compassionate and supportive community, be part of the conversation. Our thoughts impact how we feel and what we do, creating the life we live. The CBT Journal can help you create a life you love. This is a very helpful, practical resource that has really made a difference to me. I have been wanting to make changes in my life, but didn't know where to start and wasn't sure I was ready for therapy. This journal is the answer. It clearly and simple illustrates the connection between thoughts, feelings and behaviour and gives effective strategies for improving your psychological wellbeing. I found the worksheets extremely useful - they have helped me to identify and change negative thoughts and patterns of behaviour. I am feeling more positive and in control. Highly recommended. I particularly enjoyed learning about how the brain works – the part on neuroplasticity was fascinating – and the fact the journal was peppered with uplifting inspirational quotes. Your mind is one of your most precious assets. Within it, you experience every moment of life. Good mental health is closely linked to physical wellbeing and it’s also fundamental to feeling happy and content. When you invest time in self-reflection, you’re able to make important shifts in your thinking. In turn, this affects what you do and how you act, thus shaping your life. In my many years as a Cognitive Behavioural Therapist, I’ve seen this pattern time and time again. The CBT Journal is based on Cognitive Behavioural Therapy or CBT, a form of psychotherapy that encourages you to become more aware of your individual patterns of thinking, feeling and doing. It also gives you the tools you need to change these patterns and improve your mental health. Is The CBT Journal For Me? The CBT Journal is designed to help anyone who’s keen to understand their mind more. Maybe you’re currently experiencing mental health problems or have struggled in the past. Perhaps you’re simply curious about your current patterns of thinking, feeling, and doing. You’re currently experiencing poor mental health, depression and/or anxiety and need tools and strategies to help you tackle the situation head-on. You’re struggling with the demands of a busy lifestyle and would like to take better care of your overall wellbeing. You’re ready to make important changes in your career or personal life and need to understand yourself better in order to make them happen. You’re experiencing symptoms of stress and need to develop healthy habits to avoid burnout. You’d like to cultivate a simple self-care practice that doesn’t require special skills or masses of time. You want to feel the physical benefits associated with good mental health, such as reducing your risk of heart disease, increased energy levels, and improved quality of sleep. You’re considering a course of therapy and would like a good foundation of knowledge before you start.